I probably shouldn’t admit this, but I rarely go over to the Saint Germain des Près area much. I know, it’s a popular destination for many, but if I head over there, it’s usually for one thing, and one thing only: Chocolate. Most of the chocolatiers are clustered over there because, well, if you can afford to live over there, that’s where most of the folks are who buy boxes of chocolate. Well, except me. So I make the trek over there to get my licks in, and say hi to the folks who haven’t seen me in a while. One such person is Jean-Charles Rochoux, whose chocolates are at the top of my list in Paris. He has just one shop, not an enterprise, and is one of the few people who makes his chocolates in Paris; real estate prices make it hard for people to set up candymaking operations. So every day, Monsieur Rochoux gets started in his basement workshop, and every few months, I go over there and see what’s new. 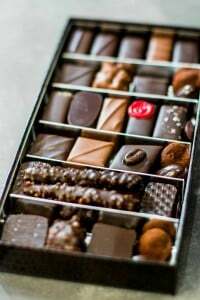 I’m a big fan of his dark chocolate bars, with are loaded with buttery, caramelized hazelnuts and almonds, as well as his liqueur-filled chocolates (especially the one with Chartruese), which you have to eat in one, gorgeous bite. Because if you try to split it, all the liqueur will dribble down your shirt – which is a good excuse for not sharing. But all the screen-lickers and droolers out there might want to get out your anti-bacterial monitor wipes – (and if you’re an adult, and you’re drooling, you might want to see a doctor about that – unless you’re dribbling Chartreuse, then I understand) and wipe down those screens with because I picked up a jar of his fabulous Hazelnut Praline spread, which is one of the best things you’re ever going to taste in your life. Well, if you come to Paris, that is. I also tasted an amazing spread make from dark chocolate and fraises des bois, those enchanting tiny wild strawberries that explode with flavor. As someone who isn’t usually enchanted by berries combined with chocolate, I almost gnawed down the tiny plastic spoon M. Rochoux gave me to taste it with, just so I was sure to get every. single. perfect. eensy. little. amazing. drop. 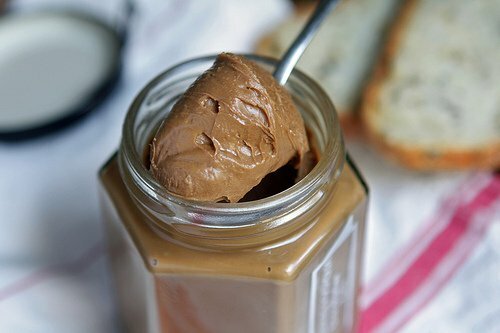 Although I’ll confess that I’ve always liked the hazelnut praline spooned right from the jar, I decided to spread a little of my precious paste on warm toast, and almost immediately, the thick paste turned glossy and soft. Adjectives don’t really suffice to describe how it tastes, so I’ll leave it your imagination. The only thing I will say is that once you open that jar, it’s pretty hard to put the lid back on, which I know from (repeated) experience. In addition to the droolers and lickers, there isn’t a recipe, please, for this out there because, well, you can’t make it at home unless you have an exceptionally strong nut-paste grinder – a home blender or food processor ain’t gonna do it. Plus Monsieur Rochoux isn’t quite ready to part with his secrets. And if I knew how to make this, do you think I would be sitting here writing about it—instead of making it myself? Looks delicious David. Perhaps a good wet grinder is what you need to make the hazelnut praline paste? You know, the type used in India to grind rice? These are heavy duty grinders but used in homes, and unlike blenders, are capable of grinding hard rice grains into a smooth paste. On an aside, I tried making liqueur chocolates (again), and though I failed (again), I have come a few steps further than the last time, so with all the good advice you sent my way, I shall keep trying (and trying). Unfortunately, where I live, good liqueur chocolates are rather hard to come by, hence my perseverance. I’m quite aware that if you lent a hand to everyone who asked you’d be a busy man! But, I thought I’d try my luck anyway. I just went on Mr Rochoux’s website and tried to order some of the hazelnut spread and it wouldn’t let me. Would you be able to offer any assistance? It has the option of overseas shipping. Any help at all would be amazing. Wow! I want some now. I absolutely love hazelnuts. Then the praline and then it’s spreadable! M. Rochoux is a genius! His shop might be the first place I go the next time I’m in Paris. Once in a while, when I lick a spoon of Nutella, I do wonder if life does get any better. You just may have shown me the holy grail of Hazelnut spreads. I must confess, I don’t usually get over to Saint Germain des Près much, either (unless I’m hosting visitors, that is), but I might have to make a special trip for that chocolate and fraises des bois spread. Chocolate and strawberry is one of my favorite flavor combinations in the world. Thanks for the tip! 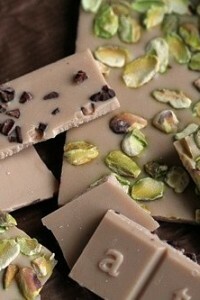 Diane: On Saturday’s, M. Rochoux does a limited amount of chocolate bars using freh fruit. Since it’s strawberry season at the moment, you might hit it right if you like berries and chocolate. He only makes a certain amount, so you might want to head over earlier in the day. Dinushika: When I was in pastry and chocolate school here, they had very heavy duty grinders with granite rollers, which were about the size of a dishwasher. So am not sure it could be reproduced at home. And for me, it’s another excuse the visit the shop! 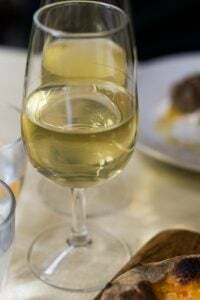 Speaking of St. Germain des Pres, have you ever eaten at Le Petit Zinc? That was our fave place for a long time for uncomplicated, fresh delicious dinners. The bouillabaisse was ridiculously tasty and an order for the two of us arrived in what can only be described as a baby’s bathtub….. And I don’t know WHERE they get their mushrooms but I haven’t had any that tasted quite that earthy and woodsy since….. Thank you for keeping me feeling connected to the one city I would move to in less than a heartbeat given the chance….. I make this at home. Granted, the hazelnuts are ground in a processor so they’re not as finely ground as in a commercial spread, but that exquisite chocolate hazelnut flavour is there. Considering how much sugar is in the North American Nutella, I don’t mind a little texture (it’s hazelnuts, yum!) in the homemade alternative. This spread actually doesn’t have chocolate in it – it’s just a paste mostly made of caramelized hazelnuts. He uses hazelnuts from Piedmont (Italy) which are of very good quality, too! My kids loooove Nutella, and I was looking forward to seeing a recipe. Any chance you can convince him to give it to you?!? 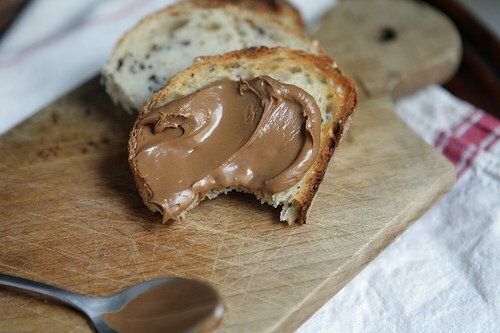 David – you mentioned that this spread does NOT have chocolate so for a little clarification for those who may want to purchase this on his website – it is probably NOT the same as the Piedmont Hazelnut Chocolate spread in the e-boutique section of his website (for 9.70 Euro)? It’s just that someone upthread mentioned the website, in the hopes of ordering some online. Thanks for the post. Hi Russ: Yes, the spread does not contain any chocolate; the ingredients listed are hazelnuts, sugar, whole milk powder, cocoa butter (the white-colored fat from cocoa beans), vanilla, and lecithin. When I was in the shop, there were four spreads – this one, the chocolate-fraise des bois, and a salted caramel spread. Am not sure what the 4th one was, though. I like this one because it’s just one flavor – and a good one at that! 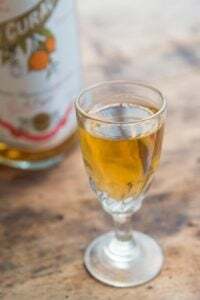 I have to try that spread with the fraises du bois – sounds fantastic.I stop at Debauve et Gallet on my occasional visits from the bled. Next time it’s going to be Rochoux. Flattery and begging are likely totally annoying in comments – it won’t stop me from writing that if anyone were up to the task of trying to replicate this at home it would be you. My last two trips to Paris were foiled by 9/11 tragedy and the volcano in Iceland. I think the universe is against me ever returning! So, if I were to make a praline with roughly chopped hazelnuts and process the hell out of it in my food processor, I know it wouldn’t be quite there, but would it be as close as you can get to the Paris version if you are unable to leave Seattle? I suppose if it didn’t work out, the paste could be stirred into a chocolate ganache and spread between thin layers of crisp meringue? Lucky me! I had the pleasure of spending an hour in M.Rochoux’s shop in April. I did manage to bring home a jar and it is still in the pantry sitting unopened. What a wonderful artisan. The enthusiasm for his craft just emanates from him. We still have a few bars left too. 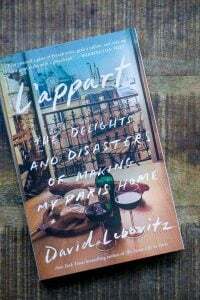 So, if you are heading to Paris, take it from David, this is one place you want to go! Rochoux’s hazelnut spread may be a far off treat, but did you know that Speculoos spread is now easily available here in the US at Trader Joe’s renamed as Cookie Butter? Yum! What about using a Thermomix? Would that work? I don’t know as I’ve not used one. They were going to send me one to try a while back, as a loaner, then rescinded their offer. Lovely as always,miss walking in Paris and just entering the chocolate stores by smell. Thank you for sharing and have a beautiful summer as you wrote before of a jam packed month. Any luck making chocolate butter with Pine Nuts in lieu of hazelnuts? My children are allergic to both peanuts and tree nuts, but not pine nuts (which are actually seeds). I want to hop on a plane to Paris right now just so I can eat this stuff by the spoonful! Just wanted to say thanks for your blog. I visited Paris last September with my best friend. She had to travel there for work and I was the lucky fool who got to tag along. So I resurrected my college french and spent some of the most amazing four days of my life in Paris. The Parisians we met were kind, gracious, and very patient with me as I tried to learn and not slaughter their beautiful language. Needless to say, I fell in love with Paris and its people and I left part of my heart there in September. I love reading your blog and planning (hoping, wishing….) for the next time I will be able to visit! Thank you! WOW that looks good — unbelievably so. No wonder you don’t go over there too often — you would be broke! My intake of chocolate has increased 100% since I began reading your blog. That’s a good thing–Thanks, David! Looks Fabulous! Came across this article this morning and thought of you! David, just give me the jar and a spoon! Oh boy! This looks so delicious – I just love hazelnuts. I can’t believe there’s no chocolate in that spread! I think I need to head back to Paris….I barely scratched the surface of deliciousness on my first trip. And I wanted to tell you I made a batch of vanilla ice cream w/o a machine this weekend according to your recipe. It was wonderful and my 6- year old was a big fan! Every single recipe of yours I’ve tried so far has rocked. I’m sorry to squeeze this ice cream question in here (probably bad blog commenting etiquette) but could you tell me if it matters what kind of mint I use for mint chip ice cream? I can’t find peppermint and I see one called “sweet mint” that is supposed to be similar to spearmint. Would that do? Thank you! This looks absolutely out of this world! Bravo! If you can’t get to Paris but you live/visit either NYC or Beverly Hills try the spread at Le Pain Quotidien…it is drool-worthy and available to take home. Love your take on the Saint-Germain-des-Pres neighborhood. We had a friend who lived there for years in a beautiful apart – replete with de rigueur IKEA kitchen pour un soupçon de modernité – but we never passed a soul along boul. St-Germain once the businesses closed for the day. Thank you for the ingredient list; I am mad to try to replicate this spread until I can buy some for myself. I can only imagine how wonderful this spread is, as I was never a fan of Nutella anyways, especially since they were taken to court over false claims that it’s a healthy spread! Well, since I can only dream of ever affording a visit to Paris, or even an online order with overseas shipping for that matter, is there any possibility Rouchoux would be gracious and share his scrumptuous sounding recipe? Oh, this post is so cruel…I’m 34 weeks pregnant! Which means I’m in love with all things gooey and sweet, and can’t fly to Paris to try this. Bovetti makes great chocolate with a kind of sprinkles. Their milk chocolate bars with candied roses or violets are just great. As are their sandwich spreads. How does he get his hazelnut spread so creamy? I realise that this is far from Nutella (which I adore btw) but my own attempts at making nutella doesn’t yield the proper creaminess. Any ideas how to get that texture? Oh yes, yum! Another delicious post. Thank you David. You can be quite cruel. I CAN imagine just how it tastes. And I have determined that spreading onto any vehicle just delays the time to the next bite. nothing has motivated me to visit paris more than this blog post, right here. right now. 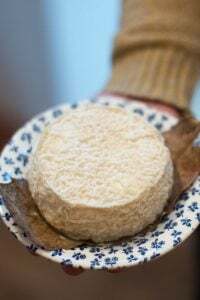 I fell in love immediately after I read the word “praliné”. Must. Have. It. Central Market in Texas just finished a two week French food festival. They brought over lavender honeys, chocolates, cheeses, wines, meats, herbs, fleur de sel, and made pastries, breads, crepes. Even though the food was canned, bottled, packaged and some made in the Central Market kitchens it was wonderful. After the festival was over I had to go back to eating American food….sad. Now I know why you moved to Paris. seeing that i already had all the ingredients on hand (including cocoa butter and lecithin, which i’d bought a few months ago at a health food store for no apparent reason), i decided to play around with ’em and try to recreate the spread. since i have absolutely no experience using lecithin, my results were far from superior texture-wise, but they were pretty darn delicious slathered on a piece of sourdough baguette from the local bakery. here’s what i did: mixed 1c toasted and skinned hazelnuts, with dry caramel made from 1c sugar+ .5tsp sea salt. let cool, and ground the whole thing in the food processor for 8 whole minutes, till it collapsed into a yummy praline butter, at which point i added about 20grams of cocoa butter, melted gently over a bain marie, mixed with 2T of full fat milk powder, and about .75 tsp of finely ground lecithin granules. the mixture was quite runny (and hot from all that grinding), but after chilling it in the fridge for a bit, it had a perfect spreadable consistency, like nutella. will definitely make this again (especially since there aren’t that many Charles Rochoux shops here in israel). also, it would make a killer creampuff filling. Thanks for the recap ~ Sounds good – and great that you came up with a delicious spread! 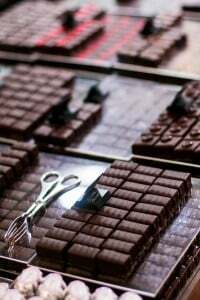 Have you ever tried chocolates by Joel Durand in St. Remy? I was wondering if you thought they compared favorably to your go-to chocolates in Paris. I too am a big fan of Rochoux. When I was a student at the nearby Assas University, we got him to make a chocolate replica of the Civil Code (the big red edition) as a gift for a beloved civil law professor. I don’t know how he did it, but the results were amazing and the professor was delighted! Fair enough! Good reason to travel to Paris in my book. 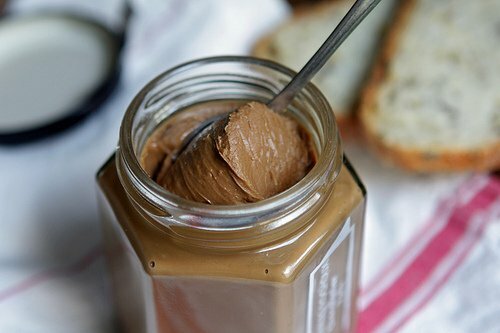 I grew up on hazelnuts and love chocolate hazelnut spreads to death. Maybe you should start an online shop for your Paris finds! I would pay for this one! 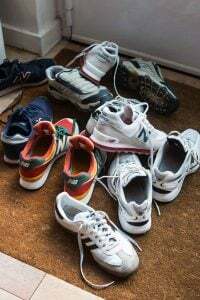 I am starting to suspect, from your somewhat acerbic tone in this post, that you find writing that includes descriptions of people’s spit and dribble slightly repellant. Just as moving from “vous” to “tu”, is an intimate step, rarely achieved purely by Internet contact; so the sharing of body fluids, or descriptions thereof, at least for me, give me a little shiver of repulsion. I don’t think that I’m a frosty b**ch, but I prefer my food blogs salvia-free. Think how much more exciting it is when there’s that reserve to be overcome. Oh, and the praline paste looks pretty damn good too! Oh my goodness, I’ve finally stumbled upon your site! I’ve read your name mentioned a couple of time online recently and had no idea who you were. Now I know what all the fuss is about! Wow, this spread looks amazing! – much like a dulce de leche. I have to make something similar, despite your warning of it not working in a food processor. I’ve been on a nut kick lately. 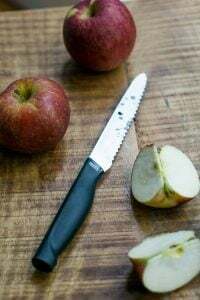 A couple of years ago I was introduced to Ani Phyo, raw foodist, and she got me started on using nuts in ways I would never have thought of before. I’m not a raw foodie, but a gluten-free foodie. Recently, the publishers of “Eat Raw, Eat Well” donated a couple of recipes to my blog and one was a raw, vegan, cashew cheesecake. It looks like heaven on a plate! 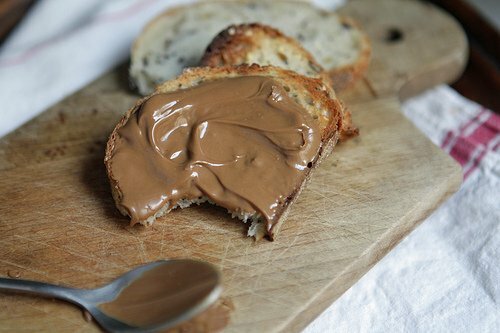 I’ll definitely be experimenting in the kitchen soon on a hazelnut spread. I’m thinking ground hazelnut flavored dulce de leche. I bet I can get them smooth enough if I soak them first before processing. Thanks for all your do, and congrats to you for all your success! I’ve never given it much thought but I’m liking the idea of using a heavy duty Indian rice grinder. The ones used in homes are not quite the size of dishwashers. More like the size of a really big Kitchenaid. Probably twice the size of a Kitchenaid, actually. Or bigger. And they have these huge granite rollers, which are capable of breaking down uncooked rice and lentils into a silky smooth paste. But you’d need to make a large quantity and hazelnuts are so expensive…if I give it a go I’ll post back. Delicious! I paid a visit to Rochoux when I was in Paris in Feb 2008, and ended up picking up cute gifts for girlfriends back home. At the time, he had chocolate letters, so I got everyone the letter of their first name. Very cute with the added bonus of being sinful! I wonder if he still makes them? Just the plain ganache from Jean-Charles Rochoux is one of the top ten tastiest things I’ve ever tasted in my life. I cannot imagine how delicious this paste is. Must go soon! oh david – how you tease. 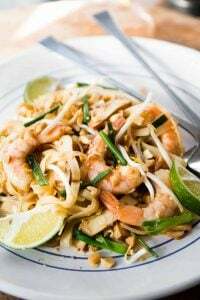 torturously delicious pictures and no recipe! is this your idea of psychological revenge because we asked too many kitchen questions? for all my fellow erstwhile nutella fans – it gets that glossy and smooth etc cos of all the modified oils, lecithin etc they put in there. thus why you don’t get that effect at home with just the pure basic ingredients. we searched and searched for a healthy alternative and have happily found nocciolata – organic chocolate hazelnut spread from italy. most large supermarkets in the US have it. amazon and vitacost have it, too. it’s intensely chocolatey and hazelnutty – yummm – but less sweet than nutella. we love it dangerously much and so i only keep one jar at home and hide it. or else in plain sight it is gone in just a couple of days. @maya thanks for sharing the recipe! i’ll have to try it. until i get to paris and monsieur rochoux’s store. I ducked across to the 6th yesterday and picked up a jar of this. God it’s so good! I also bought a block of his milk chocolate with apricots which is out of this world. Thanks for the recommendation, I’ll be heading back there this weekend! I’ll be in Paris for a few days in late June and I am scooting over to St. Germain de Pres to try some of this paste. Thanks. I’ve loved Nutella since I first tasted it 41 years ago in Florence. I agree with The Celiac Husband…..and this pictured spread appears to be the pinnacle, the piece de resistance of all hazelnuts spreads. Gotta get me some.